Nearly 40 people were killed and up to 80 wounded Tuesday night when a truck bomb exploded in front of a construction company in Kandahar, Afghanistan, chief police commander Fazel Ahmed said. “I have to tell you that I was both angry and I was repulsed by the reception that a convicted bomber, guilty of a huge terrorist crime, received on his return to Libya,” Brown said. Abdelbeset Ali Mohmed al Megrahi was released from custody last week on compassionate grounds, as officials say he is dying of prostate cancer and has just three months to live. 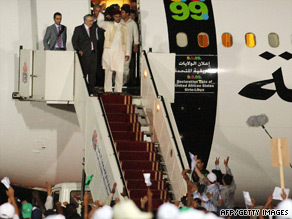 He received a hero’s welcome upon his return to Libya, his plane greeted by jubilant crowds — an incident that drew international outrage. Speaking at a news conference with Israeli Prime Minister Benjamin Netanyahu, Brown said the British government had no say in the decision to release al Megrahi, something he said he made clear to Libyan leader Moammar Gadhafi when the two met over the summer. “Because it was a quasi-judicial matter, because it was a matter legislated for by the Scottish Parliament and not by us, it was a matter over which we could not interfere and had no control over the final outcome,” he said. Scottish Justice Secretary Kenny MacAskill defended the controversial decision to release al Megrahi before an emergency session of Scotland’s Parliament on Monday. “Those were my decisions and my decisions alone,” he said. “I strictly followed due process.” He said Libyan officials told him al Megrahi would be received in a “low-key” manner. “It is a matter of great regret that Mr. al Megrahi was received in such an inappropriate manner,” he said. Al Megrahi, 57, was serving a life sentence for the bombing that killed 270 people, including 189 Americans. Monday’s emergency parliamentary session was seized on as a chance to pile pressure on the ruling Scottish National Party by opponents from Scottish Labour, which is allied to Brown’s Labour Party. Scottish Labour leader Iain Gray said during the meeting that MacAskill had “mishandled this whole affair from start to finish.” “Between the scenes of triumph in Tripoli and the pain and anger at home and abroad, is there anything Mr. MacAskill now regrets about his decision and the way it was reached” Gray asked. U.S. President Barack Obama reacted strongly to al Megrahi’s welcome, calling it “highly objectionable.” Other U.S. officials have criticized the decision to release him.